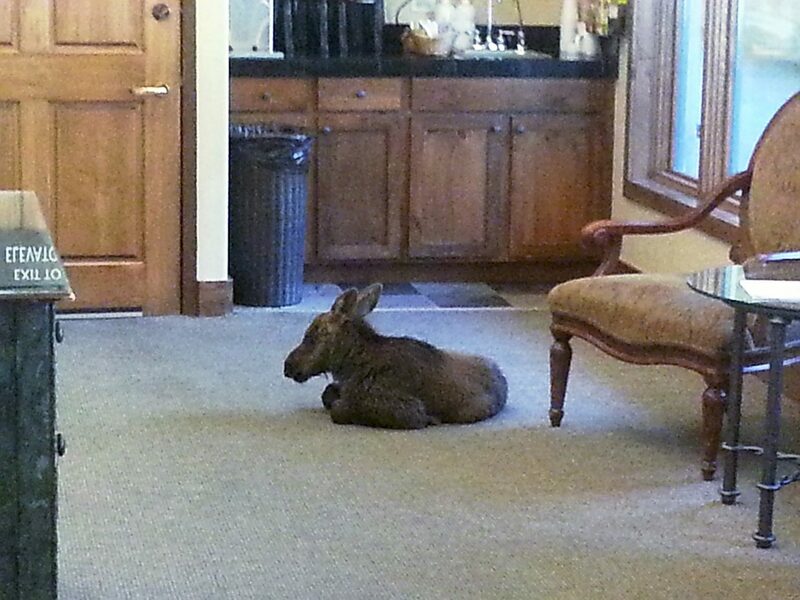 A moose calf wandered into the lobby of the Antlers of Vail Monday morning. The baby had become separated from its mother and stayed in the hotel for 10 to 20 minutes before running back out into the street. VAIL — Staff at the Antlers at Vail were startled Monday morning to see a moose calf in the lobby of the Lionshead hotel. According to Antlers staff, some children were chasing the little moose, which wildlife officials estimate to be about a week old, until it wandered through the lodge’s open doors to seek refuge. Staff called law enforcement, but the moose left the hotel and went running down the street before wildlife officials could arrive. Police and wildlife officers received reports earlier in the day that the calf was wandering by the creek near the Forest Road bridge, bleating and attempting to cross the stream. Kevin Wright, Upper Roaring Fork District wildlife manager, said he had hoped the mother would return for the calf without having to intervene. “Long story short, the next thing that happens is I get a call about the calf in the lobby of the hotel,” said Wright. While the story had an inherently comical twist, Wright said the experience wasn’t a good one for the moose calf. Because the young moose was subject to so much human interaction, and because the mother moose never turned up to get the calf, district wildlife workers had to tranquilize the moose. It was transported to a Fort Collins facility, where it is being cared for along with another abandoned moose calf. “At this point, its future is undetermined. It’s unlikely that we’ll ever be able to release it back out into the wild because of all the human interaction it’s had, and when they’re that young, the experience imprints on their mind,” said Wright. If you see any sort of wildlife and their young offspring around, Wright recommends keeping your distance and giving the animals space. Sightings of newborn deer, elk and moose aren’t uncommon at this time of year, and bears recently had their cubs as well. Moose, which can be aggressive animals, especially around their calves, should be regarded as dangerous, said Wright.